City Councilmembers have backed away from adopting ordinances to allow medical marijuana dispensaries and grow facilities to operate in Hamtramck after an outcry from mostly Bengali and Yemeni community leaders at Tuesday’s council meeting. Medical marijuana card holders will have to continue to shopping outside of Hamtramck to fill their prescription. The city council decided to not vote on two ordinances that would allow dispensaries and grow facility to operate here. The move was not unexpected. Since the ordinances were put together and proposed, there was a sudden outcry mostly from the Bengali and Yemeni community leaders. They were once again out in force at Tuesday’s council meeting where the ordinances were on the agenda for consideration. Once again opponents said allowing dispensaries would lead to children getting their hands on marijuana and that the operations would attract more crime. 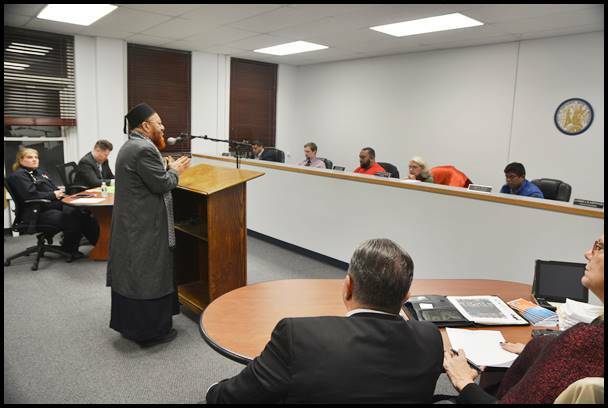 At Tuesday’s meeting several people spoke out against allowing the sale and growing of medical marijuana in Hamtramck. One man warned the council and mayor to think hard before voting. “Fear god because one day you will be questioned,” he said. Others reminded the council that in the November Election, a majority of voters in Hamtramck voted against a state proposal to legalize the recreational use of marijuana. While that proposal lost by 500 votes, state voters approved it. That means like it or not, recreational use of marijuana will be legal here – although Councilmember Saad Almasmari said the city should still make it illegal. One resident, Robert St. Mary, tried sarcasm as a way to show the benefits of allowing the sale and growth of medical marijuana in Hamtramck. When he lived in Colorado, St. Mary said, it was “horrible” what happened when marijuana became legal. City officials had said that the main reason they want dispensaries and grow facilities to locate here is beef up the city’s tax revenue. In a serious note, St. Mary added that it would be better for the city to allow dispensaries and grow facilities because it would allow Hamtramck to regulate them. St. Mary’s attempt at sarcasm failed with at least one person in the room. Later in the meeting, Councilmember Almasmari said St. Mary’s comment that medical marijuana becoming legal in Colorado was “horrible” was further proof why Hamtramck should reject the facilities. Carrie Beth Lasley suggested a third option: a compromise to allow only grow facilities that would be out of sight in industrial areas. After the ordinances were withdrawn from the agenda, which means they are now in limbo until someone resurrects them at a later date, some of the councilmembers thanked those who came out in opposition. Council Pro Tem Anam Miah said the council acted on “behalf” of what the public wants. “We are listening to you,” Miah said. Mark, are you trying to insinuate that dispensaries attract thieves? If so, that’s an uninformed opinion that has nothing to do with reality. Do you recall the legendary Willie Sutton quote on why he robbed banks? Medical marijuana dispensaries are “cash cows” in addition to having copious amounts of marijuana on hand. I wonder what the position is of local police personnel on whether they want dispensaries within city limits? I cannot imagine they want this type of headache. The issue of medical marijuana will likely be shelved for a very long time by Hamtramck City Council. The controversial issue was promoted largely by outside forces seeking to obtain permits in the city and initiate lucrative sales of medical marijuana. This was a major defeat for Mayor Karen Majewski and her allies on City Council who were trying to obtain passage of the proposed medical marijuana ordinance. Another example of how these medical marijuana dispensaries are “crime magnets”.